Let the Reading Work Begin! Welcome back! We hope you rested this weekend and are ready for the week ahead. By now, many teachers have established some basic routines and are looking towards the rest of the year. Of course, all routines will have to be practiced and revisited throughout the year, but most children know their spots, can locate their baggies and writing materials, and are ready to go! Now you need to teach them some things they can do in those spots and with their tools and materials. So in this post, we will explore some of the charts you might be making around the important work in reading that your children have begun. We have divided this by grade level, but you may see charts in other grades that speak to you as well. As always, we want you to look at these charts as inspiration for you, not as a product to copy. The best charts have your voice, and your children’s voices firmly implanted on them. 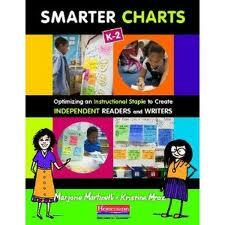 Amount of writing versus amount of visuals: Charts are meant to be used by the children in the classroom. If most children are not yet reading, charts with lots of words will be overwhelming and unused. The big strong visuals will remind children quickly and easily the job of readers during readers workshop. It shows, not just tells, in a way that is understandable to any child. When making charts consider the amount of print that your children will be able to reasonably handle. Use of actual texts: Kindergarten children are nothing if not concrete. You may say they look like “a million bucks” and they will stare right back at you, as if you have spoken in another language. And, in some sense you have, until you explain the mysterious phrase. 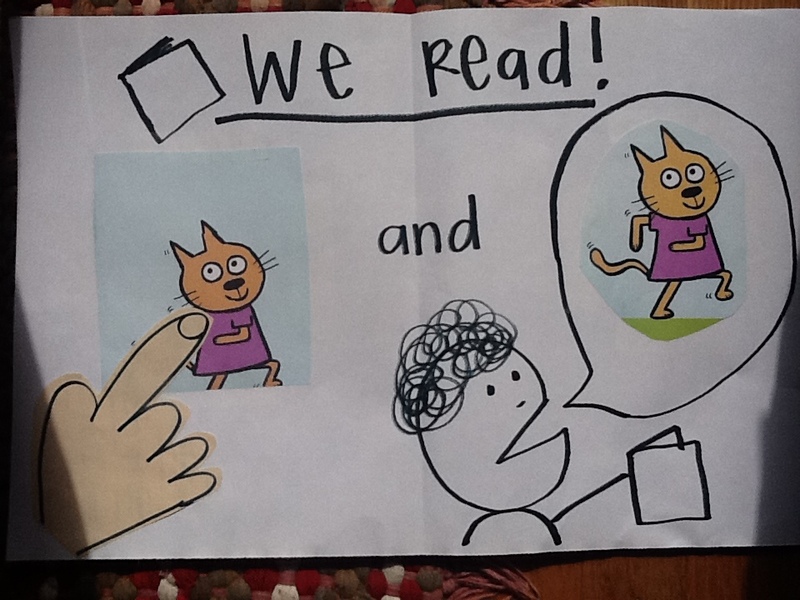 Using actual texts (these are just color copied on a printer from Mo Willems lovely book, Cat the Cat, Who is THAT? ) will not only draw attention to the chart, but will cement the skill in children’s minds. The teacher in this case used this text to demonstrate the skill of touching what was in the picture and saying what she saw, and then put the same page on the chart. Just like in the writing chart in the previous post that used the actual paper, consider if you can use the actual item on the chart. Amount of writing versus amount of visuals: This first grade chart has more writing, but still a strong amount of visual support. The vocabulary is not overly complex, the phrases simple, and the separate strategies are divided by color to make the information on the chart easier to group. There are steps: This chart could just have had three bullets that say: set a goal, make a plan, meet the book, and be done. Instead, this teacher felt that each of these ideas needed more development, so provided a series of steps for children to follow. When you are teaching something that feels complex, it can help to break it down into a few simple steps and record those on a chart. Try not to have more than four or five steps on any one chart, because more than that becomes hard to follow, and even harder to remember. Amount of print versus amount of visuals: This second grade chart is much heavier on print, but the print is broken up in an accessible way. And it still has visual support. In general, we try to avoid charts that look like unbroken lines of print with tiny visuals. We want charts to work like billboards, where kids can get the meaning in a drive by way. In other words, in a split second the message is seen and understood. It is growing: This chart has only just begun! 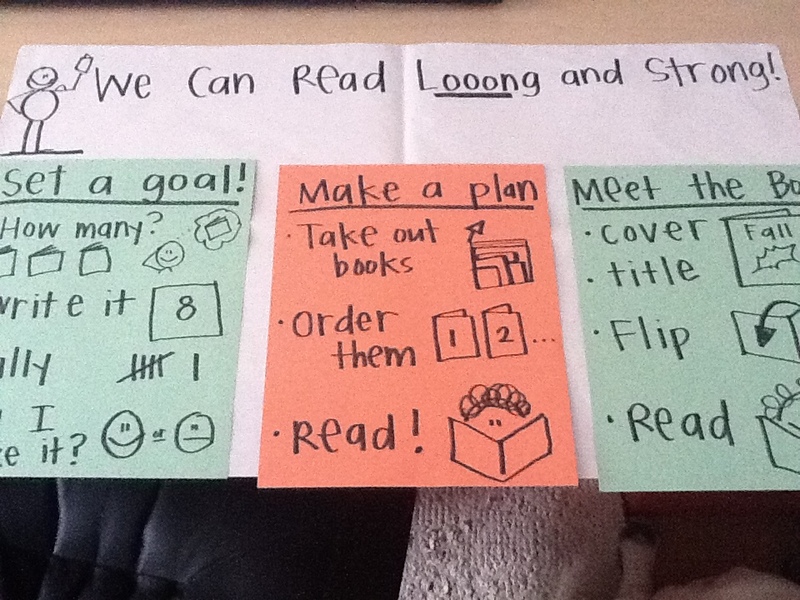 The teacher will be adding additional strategies as she teaches them to the readers in her room. 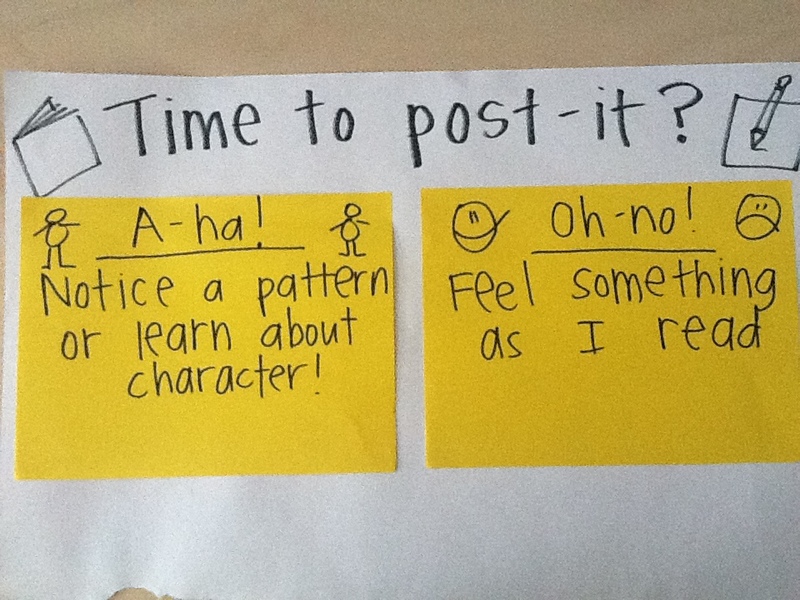 The nice thing about the large post-its used on this chart is that they allow the teacher to easily add on. Another lovely aspect is that children can take them off. If students need help with a particular strategy, they can pluck it off, put it near where it is needed, and then return it when they are done. Some of you have asked about sending in your own charts! Please do! The best way to do this is to send photos in an email to chartchums@gmail.com. We have already received some which have been posted, and others that we are holding on to until we have the perfect post for them. We’d also like to give a big THANKS to those of you who have been referring this blog to your friends and directing others to this site. Making powerful, effective, and accessible charts that support independence is not easy work. So we appreciate you taking this journey with us.